There are lots of different types of people. There are the up with the lark, out for a run ones; the jump out of bed and clean the whole house ones; and even the 6am spin class ones. But for every springy, singy, enthusiastic morning person, there are at least five other people groaning at them to shut up. For those people, we have the trusty alarm clock. They’ve come on leaps and bounds since the first mechanical, programmable alarm clock came into being (although to be fair, that was in 1847). Today, we have all manner of creative ways to kickstart your day, so read on for our guide to the best alarm clocks out there right now. Can’t stand the ring of the alarm? Go for a clock radio that’ll wake you with your favourite station, or an iPod dock that’ll play your carefully curated Good Morning playlist. Suffer from hearing loss, or have to be shaken out of deep sleep by your other half? Try an alarm clock with a shaker pad to startle you from under the covers. Short sighted or can’t reach the clock at night to check the time? Look for a projector clock that shine the time on any surface of your choosing. Finally, if you detest being shocked awake more than most, give a gentle wake-up light alarm a try, perfect for those dark mornings that make it extra-hard to get up. The Philips Wake-Up Light Alarm Clock goes the gentle route to getting your day started. Over 30 minutes, the brightness of the warm white light gradually increases to mimic a natural sunrise, and follows up with a sound alarm for stubborn sleepers. The brightness is fully adjustable, and it doubles up as a bedside lamp, making it an ideal buddy for before-bed reading or getting ready on dark winter mornings, for a natural wake-up call that doesn't jolt you out of bed, this is our top pick. Tick, tick, boom! This ultra-loud alarm clock with light and shaker pad is one for the deep sleepers. That the Sonic Bomb alarm clock is described by its manufacturers as “ballistically loud” says it all. With its combination of ultra-loud ring, shaker pad for placing under your pillow or mattress, and bright flashing LED lights, this is the alarm clock to end all alarm clocks for deep sleepers, shocking three of your senses into wakefulness at once. You can set two alarms at once with variable volume and pitch, which is a nice touch for partners with different rising times. The translucent casing and curvy shape of this colourful alarm clock makes it look decidedly high-end, and it has the functionality to back it up, too. With options for Bluetooth audio and FM radio, as well as a USB port for charging devices, it’s a smart little hub for keeping by the bed, and the choice of colours sets any mood you like for day or night. For vintage homes and classic tastes, this traditional double-bell alarm clock from Acctim is just the ticket. The clear, minimal face lights up with the push of a button for easy reading in low light, although if you’re used to a digital clock, you might find that analogue takes a bit of deciphering in the wee small hours. The loud bell is great for heavy sleepers, too — and did we mention how good it looks on the bedside table? If you’re an early riser with a spouse who sleeps in (or vice versa), this silent alarm is a great option that’ll keep the peace and avoid morning grumpiness. And, with its insistent vibrations, it’s great for those with hearing loss, or just people who despise regular sound alarms. Simply download the accompanying app, choose from three levels of vibration, and place the small disc under your pillow ready for a tactile wake-up call. And if you ever do fancy a change, there’s an alarm function, too. 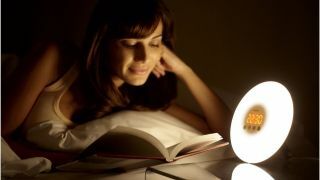 Check out the best bedside lamps to accompany your alarm clock.